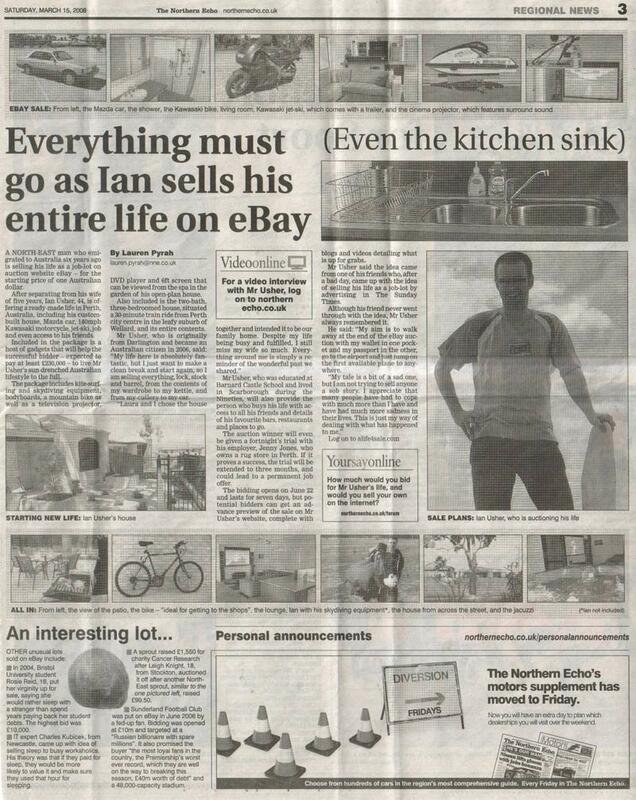 Just over two years ago, on March 14th 2008, my ALife4Sale website went live on the internet, and the next day, an article appeared in my old UK home newspaper, The Northern Echo. From then onwards, my life was turned upside down, and the next couple of weeks became a crazy whirl of TV interviews, radio and newspaper interviews, and phone calls from around the world. I even had several movie producers from Hollywood contact me to ask about the movie rights to the story. I had picked the 22nd of June 2008 as the day the week-long auction would start on eBay, and then simply counted back 100 days from then, and picked the 14th March as the day to launch the website. At the time 100 days seemed like a long time, but the weeks just flew by. It was such fun being interviewed about what I was doing and why, and writing blogs about how crazy my life had become. For a while I had a TV documentary crew following me around too, which was a pretty unique experience. And so just over a week ago, as March 14th went by again, I wondered when it would be 100 days until my 100 weeks comes to an end. And today, Friday 26th March 2010 is that day! I can’t believe it has now been two years since I started this whole crazy adventure. The time has gone so quickly, as I guess it always does when you fill your life with interesting and exciting activities. And I know that although 100 days still sounds like a long time, it will pass incredibly quickly, especially with some of the plans I am looking forward to completing in that time. I am a little ambivalent now about the fast-approaching end of my journey. Money is getting a little tight, and I am looking forward to stopping the endless spending. I am also looking forward to actually settling in one place for a while, and simply taking a bit of a break. My stop here in Australia for a month has been a lovely, but brief respite from the constant movement. However, I have still had to plan new travels, make new bookings, contact people and make arrangements, sort out accomodations, plan for tricky goals, and write about what I have been up to. But I am incredibly grateful to Marty and Carol for offering this small oasis of calm for these few weeks. But the other side of the coin which I must consider as the last 100 days begin to disappear, is what the future may hold for me. Where do I want to live? What do I want to do? How will I ever settle anywhere after two years of endless travel? What does life have in store for me next? I was asked many times, in many interviews in the run-up to the ALife4Sale auction what I was going to do next. Initially I didn’t really know, and it was only mid-way through the 100 days countdown that the idea of 100 goals in 100 weeks really crystallised. I think this time, I am not quite as vague about what may come next, but after July 4th, life still offers something of a blank canvas, upon which I am now doodlng, playing with ideas and possibilities. I have some hopes, and potential plans, but can I manage to turn these ideas into reality? I sincerely hope so! I have my work cut out, but if I can get everything to come together as I hope it might, I am very excited about where life might take me next. I will be writing more over the coming days about what I hope to do next. That’s if I can find the time, of course, somewhere between night skydiving, harmonica playing, excercising, trekking to Everest Base Camp, visiting the Taj Mahal, and much much more! Previous Post And another goal revisited. Next Post Night skydiving troubles.